Following a two-day rally of 271 points, the Dow Jones stumbled 137 points to end the week 1.6% lower for a 2nd straight weekly decline. Sentiment was affected by a below-par 1Q12 China GDP growth and April’s slower consumer sentiment index coupled with escalating credit default swaps on Spain, overshadowed a batch of better-than-expected earnings results by JP Morgan and Wells Fargo. Meanwhile, commodities and bond prices dropped, as investors sought the safety of government debts. Wild swings will prevail on Wall St this week amid headwinds from higher gas prices, a European downturn and slower Chinese growth. Key economic announcements in focus are retail sales, empire state mfg survey, IPI, housing starts and Philly Fed index. Meanwhile, investors will see whether last week’s 1Q12 positive earnings momentum will continue. Among the marquee names on this week's earnings calendar are Intel, Johnson & Johnson, Coca-Cola, DuPont, Microsoft, American Express, General Electric, Citigroup, Goldman Sachs and Morgan Stanley. 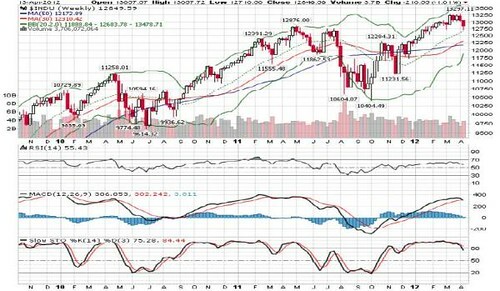 Technically, indicators are pointing towards more downward consolidation. If Dow falls below recent low of 12710, selling pressure could accelerate and take prices lower towards weekly mid Bollinger band of 12683 and 30-w SMA of 12310. 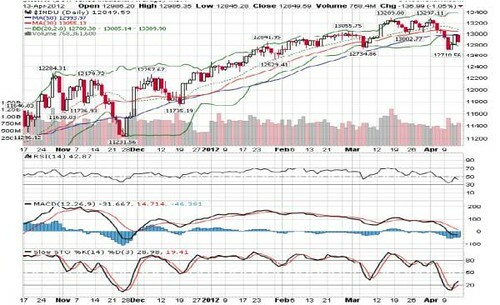 Resistance levels are situated at 13000-13100.